The belief that faces can be lucky and unlucky is something as old as the hills. Our grandmothers subscribed to it and in the old days, they would search intently for such signs in their offspring and potential sons and daughters-in-law… These days, face reading that focuses on the potential of wealth luck continues to fascinate us. This new year of the Metal RABBIT, when the chi energy of the 24 mountains brings several indications of BIG AUSPICIOUS luck ripening into prosperity for many, Lillian Too brings you the NINE clear indications of wealth luck revealed on the face. 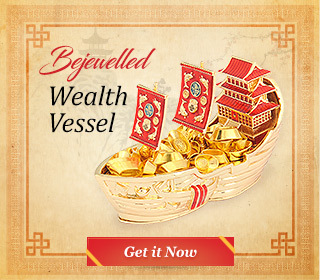 The FACE is where expert destiny experts look for symbolic mountains and rivers on the face, for these are regarded as the vital indicators of wealth and abundant good fortune. Start by looking at the central axis of the face as this the crucial starting point of anyone’s destiny. How your life will pan out in terms of good times and bad times is strongly indicated by the symmetry and balance of the two sides of the face. To the Chinese, the first requirement of a “wealthy face” is symmetry of the two sides of the face. Only when this is properly indicated can there be good balance, which in turn leads to things going smoothly for you. When the face does not have this all-important balance, it is believed that a difficult life lies ahead. The central axis of the face reveals whether the face is balanced or not. Only balanced faces are deemed to be lucky. It is thus a good idea to avoid selecting hair styles that tend to upset this all-important balance of the two sides of the face. Those with high and rounded foreheads are said to possess the potential for wealth. This is considered a highly reliable indicator of wealth. It also suggests that wealth comes early in a person’s life. The forehead signifies luck sent from heaven. The forehead is also considered the first prosperity mountain of the face, so ideally it should be gently curved, round, high and even slightly protruding. A forehead like this suggests not just wealth but authority and great power as well. If you have a forehead like this, it is likely that you command respect and possess the charisma of authority. A perfect forehead is rare, but as long as it looks prominent and wide, then genuine good fortune is indicated. High foreheads also suggest high intelligence and an ability to think quickly on your feet. The Chinese believe that a good forehead supports all the other luck features of the face since it also signifies the place of the heavenly celestial dragon. This is a yang spot on the face and a very reliable indicator of a person’s luck potential. It is vital to look after your forehead, keeping it clear of blemishes and unsightly pimples. Use artificial aids if you need to, especially if it ensures that your forehead is smooth and unlined. Using cosmetics to even out skin tones and reduce blemishes and lines brings good fortune, so this is something that is highly recommended. Moles on the forehead should not occupy the centre. Black moles here are unlucky and are best removed. Red moles tend to be luckier. A person’s nose (actually its size!) is the best known measure of a person’s potential to get rich, and men who possess a fleshy nosy is a great favourite with superstitious old aunts and grandmothers! The Chinese always regard a big nose favourably, no matter how out of place it may look. The nose is the repository of money fortune, indicating wealth from many sources. However, this indicator of wealth is said to be more reliable on a woman’s face than on a man’s face. The rounder, higher and larger the nose is, the better, and on a woman, this is said to bring great wealth to any man she marries. I have a friend whose nose is the one thing you notice each time you see her. When they married, her husband was far from rich, but today he is a serious billionaire! I like to use her as an example of the big nose theory, but have to confess that her husband does not take too kindly that all the credit should go to her nose! Readers should nevertheless take note that the nose (from between the eyebrows right to its base) is an important part of the face and it should really never be cut or surgically altered in any way. The most famous celebrity whose series of nose jobs brought him misery and ultimately death has to be the late Michael Jackson. 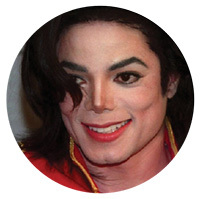 If you look at the before and after pictures of MJ’s nose, the transformation is quite startling and of course, everyone knows how his fortunes waned as his nose looked increasingly more and more like the nose of Diana Ross… and less like the original MJ. So leave your nose alone! But you can make up for this by using cosmetics to make the top of the nose look clear, bright and luminous, with no blemishes or spots. There should be no hair, patchy colouring, spots or moles here. Spots suggest blockages to your money luck. When the bridge of your nose is high, clear and luminous, it suggests a life of affluence and comfort. The nose is a yin spot. It symbolizes one of the rivers of the face. Chinese classical texts on face reading refer to the nose as the river Jie, a river that brings great wealth. 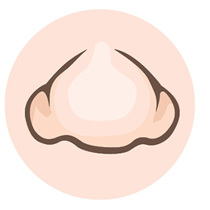 The rounder and fleshier the nose looks, the greater the wealth that is brought. Nostrils should be neither too small nor too large. Moles at the tip of the nose are a major sign of misfortune. 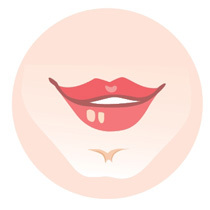 This little pearl-like protrusion on the top of your lips indicates effortless good fortune. Wealth luck is often with such people from birth. The pearl is regarded as a gemstone to the Chinese, so this is a feature that also suggests class and prestige. It looks round and is slightly protruding, and those who have it will usually have had it from childhood, visible on them as newborn babies. When a newly born baby has this feature prominently obvious on its little face, it is safe to predict that the child will grow into a very lucky adultindeed. Like the cleft chin or the dimple, the pearl is regarded a beauty spot, so it brings attraction luck to both men and women. The mouth pearl is also regarded an indication of wealth, and is highly valued on the face of a woman – especially on prospective daughters-in-law, as they bring good fortune luck to their husbands. The pearl also suggests that the person possesses the power of speech. Some refer to this wealth spot as the phoenix pearl. regarded as the second river on the face. It is the river Huai, an auspicious waterway when it is delicate, relatively small, but still soft and succulent. Irrespective of its size, the mouth must never appear dry, since this indicates a lack of water in the river and hence a drying up of luck. As long as the mouth is always kept relatively moist, it indicates money luck. This is why it is such a good idea for men and women alike to drink plenty of water, as this replenishes the supply of water. 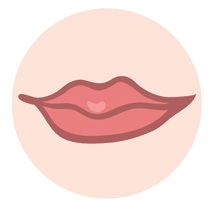 It is also good to use lip balm, as this keeps lips perpetually moist. Women have the added advantage of using lipstick and this is said to attract good fortune, especially when painted red, bringing yang chi to the face. 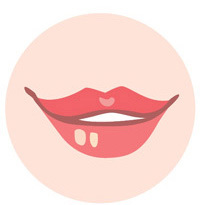 The mouth is the fifth wealth spot on the face. Moles around the mouth, as long as they are not black, enhance the good luck of the mouth. Often, small red moles around the mouth indicate that the person will never lack food. A strong chin provides a strong base mountain for the face. Here is where the wealth of the individual is stored; and to be suggestive of a person who can accumulate asset wealth, the jaw line must be prominent. An auspicious chin is slightly protruding, quite fleshy and looks like a “mountain”. Receding jaw lines are signs of misfortune in old age and can even be a sign of premature death. A prominent chin indicates a mountain and suggests a long and fruitful life. Nothing is more suggestive of a great life than bright eyes that appear alert and aware. Your eyes indicate good fortune when they shine and always with a steady gaze. It does not matter what the shape, size or colouring of the eyes are – more important is the inner vitality that shines through. 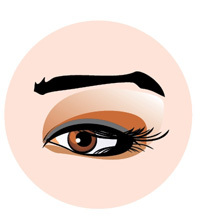 When the eyes are bright and are well protected by arched eyebrows, this indicates good health and prosperity. Eyebrows must never be overly plucked or shaved. In fact, no face must lack eyebrows! Without eyebrows, you cannot succeed at anything! Your eyebrows protect you, guarding against “attacks” by wandering spirits and jealous people. When you pluck your eyebrows, never ever pluck above the brows. 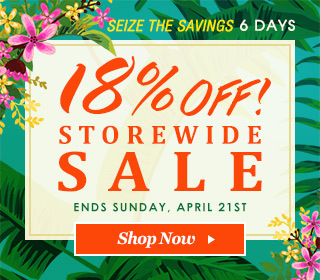 This instantly curtails your good fortune. When one eye is smaller than the other, use artificial aids like eyeliners to correct the imbalance. Once again, it is symmetry that suggests good fortune. It does not matter if your eyes lack the double eyelid of Caucasian faces; what is important is the shine and luminosity of the eyes themselves. The cheekbones mark the eighth wealth spot on the face. In terms of age luck, one enters into the center section of the face after the age of 21. When the cheekbones stand out prominently and appear bright and shiny, it predicts serious wealth about to manifest. Cheekbones should always have flesh. They should never look bony since this is an indication of harmful yang energy. They are in fact luckiest when they look good enough to pinch! The colour of the cheekbones is also important. Cheekbones that look pink and luminous are indicators of good fortune. Cheekbones that appear sallow and dry suggest a loss of vitality. When your ears are well formed and proportionate, they indicate good fortune and wisdom. They are said to represent the flow of the Yellow River. The Chinese have a great preference for long ears, as these kinds of ears remind them of Buddha. Long, well-defined ears that are not overly fleshy are a sign of class and the high-born. Of the nine wealth features, only one is placed in the youth section of the face and two in the old age section. This suggests that our destiny manifests mostly during the time of life between youth and old age – this is known as the age of maturity. Face reading gives us a good idea of our luck potential, but it is also necessary to see if wealth luck carries on into old age. In the end, this is the most crucial indicator! Our lives should get better as our destiny unfolds. The face reader should note that the face over time can and does undergo change. Mountains can flatten and rivers can run dry. It is vital to stay ever watchful, as much over our physical bodies as over the luck that we are constantly creating for ourselves. This is shown according to the diagram here. Look for discolouration, spots or indentations, which usually predict problems relating to health and other difficulties at the corresponding age. A smooth skin indicates that you have few worries. 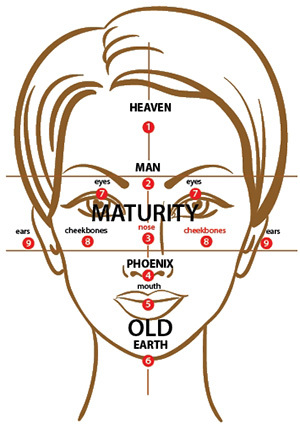 Chinese face reading has always been considered an indispensable tool to understanding our destiny and personality. 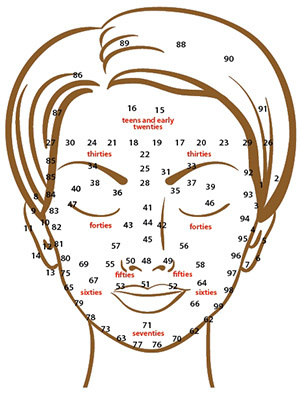 Face reading categorizes individual features according to colour, shape, disfigurements and birthmarks, and the meanings of these indications depend on where they appear on the face. A popular way to determine one’s luck at different times of life is by examining the “mountains” and “valleys” on the face. These are usually quite accurate in pinpointing at what age you will face obstacles and when your life will blossom into perfection. These readings are even better when supplemented with other forms of destiny analysis like Chinese Astrology and Paht Chee. The ears and top part of the face represent the early years of one’s life i.e. the time of pre-teens, teens and early twenties. As you grow older, your destiny is recorded progressively down the face towards the eyebrows, nose, cheeks, lips and finally the chin. Using the diagram here, note that if your current age is on the right hand side of your face, leisure dominates your time. If you are on the left side of your face, work and career matters take up most of your attention. If you are at the center part of your face, you are said to be at a crossroads and some important decisions confront you.